And we are delighted. Over the moon in fact. 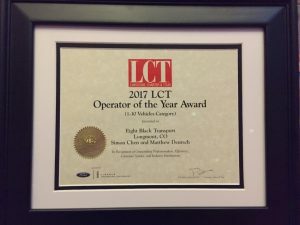 LCT is the industry authority and to be recognized nationally as the Operator Of The Year in the 1-10 vehicle category is something we are very proud of. Proud of our team, proud of our efforts and most of all, proud of the client base we have built and one we hope we can continue to serve for a very long time.